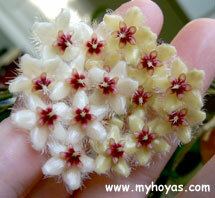 This hoya comes from Malaysia and Thailand and it was described in 1883. This hoya has a beautiful foliage best suited for growing climbing. The leaves are 9-18 cm long and 4-8 cm wide. 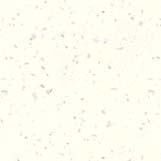 The leaves are mixed green with lots of grey spots and the underside is often red. Mature leaves are very stiff and yet fragile, while new leaves are soft and have a very "waxy" feeling. Some caudata have leaves with wavy edges. Grown in full sun, this hoya will be more red than green. The flowers are few (8-10) in each hanging flat umbel. Each flower is about 2 cm, white/beige sometimes pale yellow with red corona, flat and has long white hairs. The flowers last about 3 days, have very little or no fragrance or nectar.